Garden of Lamentations is the 17th book in the Gemma James and Duncan Kincaid series by Deborah Crombie, and the many fans of this series have been waiting a bit to have questions answered brought forth by the previous book, To Dwell in Darkness. I can tell readers that seldom has a book been so worth the wait. Crombie writes with the agility of a high-wire performer, and the result is just as thrilling. And, like that performer, so many things must be gotten just right and kept in balance for the success of the act. Garden of Lamentations gets all right, and the balance of the different story threads is exquisite. Each character, each action, each storyline is on cue. There are indeed the awaited answers, and arriving at them is a journey through 400 pages of great suspense. In my review of To Dwell in Darkness, I mentioned a deliberate progression of the storyline. 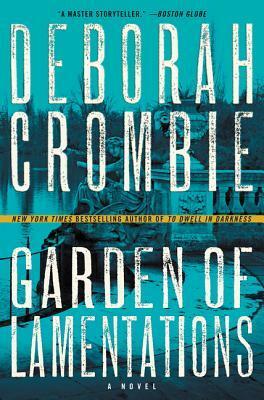 There is, of course, always a progression of character development and personal and work life, but the storyline progression that Crombie achieves from the cliff hanger ending of The Sound of Broken Glass through To Dwell in Darkness and into Garden of Lamentations shows a brilliance of forethought that puts Deborah Crombie in a very special class of writers. After the tragedy at St. Pancreas Station in London in the last book, To Dwell in Darkness, Gemma and Duncan are finally settling into their new jobs, Gemma as a Detective Inspector at Brixton and Duncan as a member of the Borough of Camden’s murder investigation team at Holborn Police Station in central London. But, before Gemma can get too comfortable at Brixton, she is requested to attach herself to Notting Hill for a case headed by DI Kerry Boatman. A young woman, who served as a nanny at one of the affluent Notting Hill houses is found dead in a private community garden. Reagan Keating’s death is determined to be murder, and Gemma’s connection to the dead girl is twofold. Gemma’s son Toby takes dance classes at the same studio as Reagan Keating’s charge and one of Gemma’s best friends was using the nanny as a model. As Gemma and Kerry get closer to the truth of this tragedy, Gemma realizes that there are other losses that will follow its resolution, and she must tread carefully with children involved and nerves unraveling. Duncan is at last putting some pieces together in his suspected corruption of Scotland Yard, where he worked before his boss, Denis Childs, had Duncan transferred to Holborn. Denis had disappeared before Duncan could confront him about the transfer, but now Denis is back at Scotland Yard and requests a secret meeting with Duncan to explain his absence. Denis is brutally attacked on his way home from their meeting, and Duncan is sure it was a calculated attempt to kill Denis, although it was unsuccessful. Now, Duncan must determine the connection of the corruption to Childs and other officers who have died untimely deaths. Past cases require discreet reexamination by Duncan and the only people left he feels he can trust, Doug Cullen and Melody Talbot. Gemma is too busy with her own case, and Duncan fears for the safety of his family. Answers will come, but at what price? Deborah Crombie has now written seventeen books in this series, and each one is a splendid piece of storytelling. Crombie compares to Louise Penny in terms of developing unforgettable characters, complexly intriguing storylines, and setting as a tour de force. It’s no surprise that readers who love one author’s series will love the other author’s series, too. There’s a brilliance of timing in Crombie’s plots that is deeply satisfying, and her ability to keep the maze on track to its clever conclusion is masterful. A note about reading series. With many long-running series, it is possible to start reading at a later point than the first book or so, and there are places in this series where that’s possible, too. But, I highly recommend that you don’t start with Garden of Lamentations in this series. There are issues and secrets set in motion several books back that come to resolution in this book. It’s possible the reader could start with #16 and be okay, but I suggest that to gain the full effect of #17, the starting point would need to be #14, No Mark Upon Her. Of course, I think that starting at the beginning of this series is the best, as every book naturally builds upon the other in terms of character development, and the characters of the Duncan and Gemma series are some of the best in my long reading history.